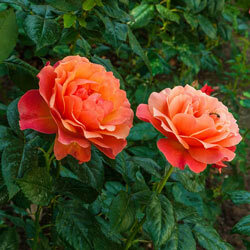 Just as its name implies, this easy-care floribunda rose is a snap to grow and maintain. All it needs is a sunny spot and ample water. Huge clusters of fully double, 3" roses open in a lush shade of pale apricot-orange—very unique for its type. These luxuriant, fragrant blooms cover a full, rounded shrub that reaches about 4-5' high and 5-6' wide. A refreshing, citrusy-sweet scent follows these roses wherever they go—whether in the garden or in a vase. Blooms heavily within the first few flushes of the season, but new buds will appear in waves all summer and sometimes into autumn. For best results, plant in full sun to partial shade. Rosa HARwelcome PP#9161. Flower Form: Medium large double ruffled blooms. Additional Information: Roses prefer a thorough watering but do not like 'wet feet'. Water early in the day to avoid wet conditions into the night which can cause issues with fungus and disease. 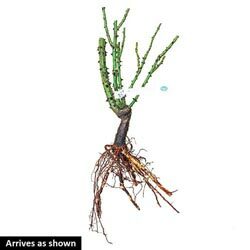 Tree version grows 4-5' H x 5-6' W.